This may seem to be the most random plug I’ve ever given. A) It seems the guy this book is about is cute. B) The writers of the book are cute. C) Boys are cute! And they like to fish. therefore: You should buy this book on bass fishing for you, or for father’s day. Since I don’t get to celebrate it. Oh, snap! Did she pull a dead-daddy card to get people to buy her friends’ fish book? She did! Shameless! I just wanted to give everyone a heads up (and blatant plug) for Fishing on the Edge, the book Brian and I wrote. 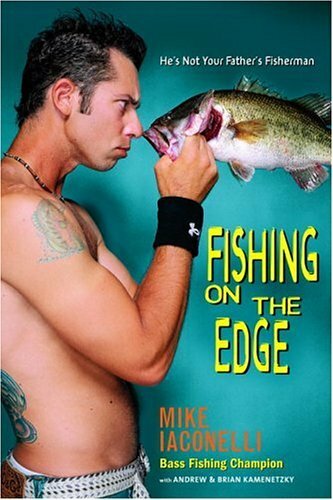 It’s the autobiography of Mike Iaconelli, the closest thing professional bass fishing has to a Dennis Rodman. Unlike most of the genteel, southern bubbas dominating the sport, he’s a young, loud, tatted out, hip hop guy from New Jersey who once thought he’d end up a D.J. and used to regularly compete in breakdancing “battles.” As he grew more successful, eventually winning fishing’s equivalent of the Super Bowl, his marriage fell apart and he nearly quit altogether. He’s actually a pretty interesting cat, even if you’re not into fishing (I basically know nothing about it other than what we wrote for this book). Obviously, we’d really appreciate it if you picked up a copy and checked it out. This is our first book and we’re really hoping to parlay it into other opportunities. Please feel free, also, to pass along the info to anyone you think would dig it. Or would simply buy a book because you told them to. Thanks so much for giving it a read, as well as your support while we were taking on this daunting task. It truly means a lot to us, and we really hope you enjoy the book.